The world’s most famous Instagram egg is back in the news cycle after it ‘cracked’, baring a positive message regarding mental health. While at the outset totally bizarre, the whole spectacle – from the initial record being broken to the recent reveal – can teach us some valuable things about youth engagement. The post gained over 18.4 million likes in less than 10 days, quickly surpassing Jenner’s post of her newborn daughter Stormi. As of now, the egg has over 52.2 million likes and the account itself has over 10 million followers. More than just the most liked post on Instagram, the egg is also the most liked online post on any social media platform. On January 19, the account uploaded its second ever post – a photo of the same brown egg, identical except for a small crack on the top left corner. Subsequent posts showed the crack growing larger until an announcement that all would be revealed in an ad produced by and aired on streaming service Hulu after the Super Bowl. 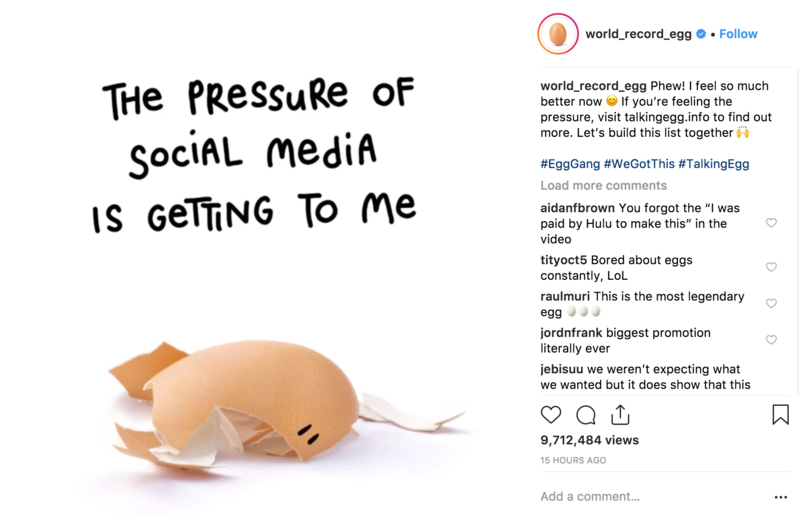 The commercial features the world record egg sharing its story about ‘cracking’ under the pressure of social media and directed viewers to the non-profit Mental Health America. The Instagram version of the ad directs users to a list of useful mental health links. This whole experience, unique as it is, magnifies a few social trends we’ve identified as strong factors driving successful youth engagement strategy. According to one of our past surveys, 49% of youth say ‘young people following their dreams’ are the stories that inspire them, compared to just 5% for celebrities and 4% for social media influencers. This is supported by additional research conducted by digital agency Deep Focus that states 63% of Gen Z prefer to see ‘real’ people in ads compared to just 37% that prefer celebrities. These are the attitudes underlying the movement that overthrew mega-celebrity Kylie Jenner for Instagram superiority. Fatigued from constant marketing featuring the rich and famous, it was easy for young people – the demographic that embraced the egg the strongest – to rally behind a seemingly absurd opponent to this hyper glamourised celebrity culture. Whereas years ago it was a photo of Kim Kardashian that ‘broke the internet’, today it is a stock image of an egg. This shows that we as an audience – and in particular the youth cohort – are moving past the whole concept of celebrity endorsement. We want authentic stories from genuine people, and we’d rather support a nonsensical egg than champion a celebrity. Once the record was broken and people all over the world caught wind of the unprecedented popularity of the Instagram egg, there was instant speculation as to how it would be monetised. Money follows eyeballs, as they say in the marketing world, and early estimates had the worth of this particular egg at $10 million. The Super Bowl has a long history linked with advertising, with many companies throwing huge budgets and their best creative minds to come up with commercials to captivate the millions of viewers tuning into the game. With the first meme of 2019 set to capitalise off this huge marketing moment, many were excited to see which brands would be winners in this race. As it turns out, the commercial was somewhat of a PSA promoting conversations about mental health and encouraging people to seek out help if they need it. Instead of inking a deal that could have netted them lucrative commercial benefit, they decided to spread positivity and support non-profits. This is aligned with a trend we have observed concerning brand purpose and corporate responsibility (read our case studies on Gillette’s and Nike’s latest offerings). Instead of focusing solely on the bottom line, brands are committing themselves to social causes – much to the delight of the younger demographic. Despite the fact that the Instagram egg’s success can be attributed to a number of growing social and marketing trends, it would be brash to claim that such an event was foreseeable. As it turns out, many online behaviours of young people are unpredictable and don’t always make sense to the older marketers whose job is to engage them. Previously we’ve explained some unique ways Gen Z are using Instagram, and this world record egg seems to be a culmination of all these behaviours. While looking at stats and research is a helpful way to gain insight into the youth market, it’s not always feasible for a company to sink the time and resources needed to stay ahead of all the latest trends. Hiring young people for their valuable insights into what best engages them is something we do consistently at Year13 and it’s always met with huge success. Check out Our Services page and download our latest Media Kit to find out how we can help your company better engage with the youth market.